Though writing is a skill much like speaking, not everyone is able to write properly in English. While this is true even among people who speak English fluently, it is especially true for those for whom English is not their native tongue. Yes – Microsoft Word provides a reasonable grammar software tool to improve English writing skills; but because it is not an exclusive English grammar software program, it does have limitations, especially if the person using Word does not know every single grammatical rule. WhiteSmoke’s grammar software was designed to address the various shortcomings associated with other English software and writing software programs available. 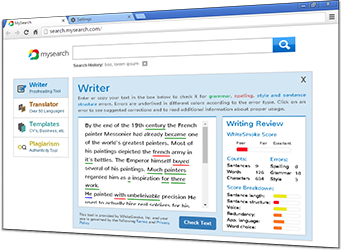 WhiteSmoke’s grammar software is part of its writing enhancement software program that assists individuals who want to improve English writing skills and learn the different English language and grammar rules. WhiteSmoke’s grammar software program comes with a variety of features that not all writing enhancement software programs may have. Our grammar software, for example, can check formal writing, do a writing review, and proofread entire texts to ensure that they follow all English language rules. Our grammar correction software will analyze each individual sentence for all structural and grammatical errors and will then prompt the writer to make any necessary changes. All mistakes are underlined, and a box will pop up providing suggestions for corrections. The grammar software program does not just change the grammatical, spelling, or punctuation error, but provides information on different corrective actions that can be done. Our grammar software corrects all punctuation errors as well. The software program compares the text to the huge database of sentences, words, sentence structures, and all possible mistakes via an intelligent algorithm that is programmed to analyze all human writing patterns. The grammar software database continues to update itself by continually scanning a large number of websites for new words and new word usages. This is to ensure the grammar software program always has the latest information on English vocabulary and grammar available at all times. 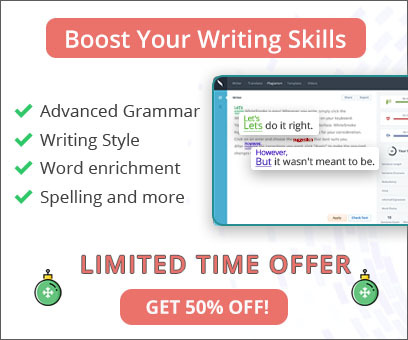 WhiteSmoke’s grammar software program is the best writing enhancement software available on the market to check all formal writing and informal writing. The grammar software assists novice and professional writers in writing professional texts, including acceptance letters, articles, academic papers, reference letters, business correspondence, research reports, and even resignation letters. The professional writing grammar software will do all the editing for you. This way, you do not have to spend too much time doing time consuming self-edits. Nor do you need to worry about overlooking a mistake. Students love the grammar software program because it saves times and it educates them on all grammar, spelling, and punctuation mistakes, while teaching them how to avoid common errors in the future. Even if you are not a student or do not write articles, papers, or business correspondences on a regular basis, it is still a good idea to use a reliable English language and grammar checker for personal correspondence or a resume.